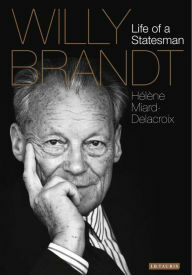 My German exchange son, Willy Golz, gave me a wonderful Christmas present this year: a biography of German Chancellor Willy Brandt written by Helene Miard Delacroix. I believe he was named after this great political icon. My soul is so inspired by the actions of this morally courageous leader. Many American millenials may not know the story of Willy Brandt, but they would be better off if they did. Willy Brandt was Germany's John F. Kennedy contemporary. They both lived during the same time period, both rising to the greatest heights of politics. His is a story in courage, perseverance and vision. He was raised by a single mother, never knowing his father. His grandfather was heavily involved in the country's socialist movement to improve wages and better working conditions. Excelling in school, he was singled out for higher education that he would not normally have been able to attain at that time. Passionate about helping others, he immersed himself in the labor movement as the country moved towards Naziism. It eventually became so dangerous to be a part of an opposing political party, he had to flee the country to avoid imprisonment. 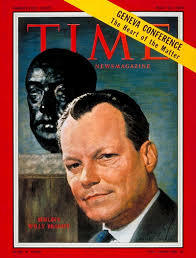 He fled to Norway and Sweden, took on a new name "Willy Brandt" and continued his activities to help the people of Germany by learning firsthand of improved labor conditions in Norway and Sweden and remaining involved in the underground German political movement. He survived and fed his family through his writings while also educating the world as to the horrors of Hitler's regime. When Hitler was removed from power, Willy returned and became the mayor of Berlin. He was mayor when the Soviets erected the wall separating West from East Berlin. He envisioned a time where the East would be reunited with the West and dedicated a career to making this happen. He was a people's leader, both on a mass scale and one to one. He relished social engagements, enjoyed rather than despised the press, and the relationships he cemented propelled him to the country's highest reigns, the Chancellor. He always opted with courage to do the right thing, many times when it was very unpopular both nationally and internationally. Two such examples included when he opened direct communication channels with the Soviets and bowed at the Ghetto War Memorial to apologize for Hitler's atrocities. Although his actions made the Allied powers very upset, they were the building blocks for eventual reunification of East and West Germany. He took critical steps to recognize East Germany as a country, which his counterparts and the country were unwilling to do (without which reunification would have been far more difficult). His brave efforts were rewarded with the Nobel Peace Prize in 1971. His entire life was marked by taking the high road where his courage was a strong suit. A Soviet spy was found among his cabinet as Chancellor and he took the heat and political fall for this, even though he was the victim. 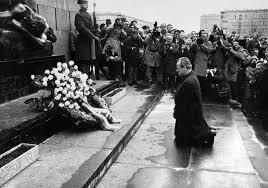 Willy Brandt never put himself over the good of his country. He led because no matter how unpopular his decisions, he persevered in doing the right thing. His moral convictions, vision, and hard work helped bring Germany from the ruined ashes of war and poverty to the powerhouse it is today. Great leaders sacrifice for the good of others. Great leaders do this by never fearing. 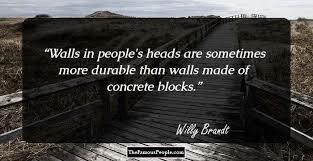 The world is a much better place because of people like Willy Brandt.